we tend to reduce everyone else to the limits of our own mental universe and begin privileging our own ethics, morality, sense of duty and even our sense of utility. All religious conflicts arose from this propensity to judge others. If we indeed must judge at all, then it must be `according to his own ideal, and not by that of anyone else’. It is important, therefore, to learn to look at the duty of others through their own eyes and never judge the customs and observances of others through the prism of our own standards. I find similar expressions all the places. May be I will add more here. Interesting thing is that when it was quoted to me as a child, it was spoken by a Muslim. 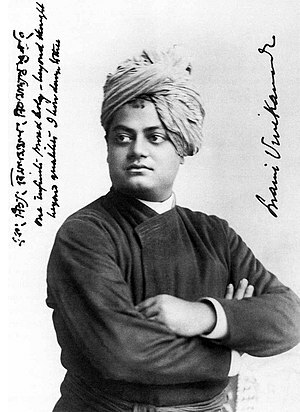 This entry was posted in Philosophy & Religion and tagged Bible, criticism., Gurus and Saints, Neighbor, religion, Religion and Spirituality, religious conflicts, Sri Ramakrishna Sri Sharada Devi and Swami Vivekananda, Swami Vivekananda. Bookmark the permalink. Victoriaji we are sitting 7 continents apart. Now tell me: Is this not a fertile imagination? LOL – like you’ve got room to talk. No. It is end of the day. Shall debate something else soon I am sure not about me but you. Until then Good Night. I look forward to it. Rest well, Sandeepji. If you had met any other lawyer you would have said ‘most certainly last’. But truth is that you have met the person behind a lawyer. I rarely discuss law here. Human race is far more important than law. BTW have you ever considered joining law? You have the traits. It bites? Never bit me. Well. It is all jumbled up. But I will write here. I agree that it is difficult to write humor in a subject like science. But that is why it is a challenge. About Preciseness, I take this entire thing rather lightly. But you come prepared in such a fashion as if we are arguing a murder trial. Any way, keep it up. There is nothing better than being natural. I will read that post. Btw, humor can be found in more than one of my postings. Hope you’re enjoying your spring evening. “This garden universe vibrates complete. That is hilarious. Beauty in X-ray! That is what I call fertile imagination. He may write a poem about dancing with water cooler as well. I agree along with my blindness. Thanks to both of you for these thoughts. As always, I am touched by what you have to share. Yes, we tend to do violence on the world even with our day-to-day view of the world, with the “tyranny of assumptions” that has consumed us and constitutes our identity so often. But, a caveat here. I don’t know if we can ever escape a “tyranny” of some sorts, even with our “liberal” and “enlightened” views. Or, to state it better, we need to be careful that we do not “tyrannize” with our “noble” thoughts. Or at least, I find that I am prone to that. Thought is too independent then we perceive. We have to be careful at all times. Yes, I see that. Though it is something I’m only learning to see. Learning is a dangerous word. Just that sometime/often you miss it. Hey Sandeepji, thank you for your opinion. In case you haven’t noticed *grin* I’m a big picture thinker. You throw a seed, and while I see the seed, I also see the tree. As far as you reading my writing and finding the precision and seriousness funny? If you are referring to my comments in your blog, well, so far the blogs entries I’ve read from you have been of a serious nature. It would be disrespectful to make light of your writings, unless you made the first move in that direction. For example, Lew and I have exchanged ‘less serious’ comments, and dare I say, joking comments in a serious blog entry. Very well said, Lew. Hitler convinced himself that his thoughts (and actions) were noble, thus tyranny became a custom of Germany for many years. The same with Stalin. Both were brutally traumatized by their fathers. Psychologist Alice Miller wrote: “Physical as well as psychological abuse of the child is not only harmful but highly dangerous. Not only for the individual but under certain circumstances for whole nations. This parental behavior is driven by societal customs, including religious traditions. “Withhold not correction from a child; for if thou strike him with the rod, he shall not die. Thou shalt beat him with the rod, and deliver his soul from hell (Proverbs, 23:13-14). Very well Victoriaji, In your usual analytical way you have expanded my thought beyond the frontiers I had intended but you are right we stifle development of child by imposing our morality of ambition. It is a problem. BTW that ‘ji’ is a suffix we use as mark if respect here. In Delhi you will find many people who would address you with ‘Helloji’ ‘how are you ji’. ‘Fineji’. But that is overdoing it. Some time When I read your writing I find the precision and seriousness funny. I wish you may right something humorous in your blog that too about science, if and when that is possible. …and never judge the customs and observances of others through the prism of our own standards. Yes, I agree, so long as those customs and observances do not cause physical and emotional harm to others. Such customs negatively impact the whole. We are all interconnected. No one is more superior than another, but thinking that others are inferior reinforces the illusion, thus certain customs and belief systems are born. Margaret Wheatley wrote: “Oppression never occurs between equals. Tyranny always arises from the belief that some people are more human than others. There is no other way to justify inhumane treatment, except to assume that the pain inflicted on the oppressed is not the same as ours. I saw this clearly in South Africa, after apartheid and during the Truth and Reconciliation Commission hearings. Thanks for the helping hand/quotes.